Port St Mary captain Trevor Quayle sealed the individual merit trophy in Ellan Vannin Fuels division one with a near perfect season winning 21 out of 22 games, losing his only game of the season away to the league champions South Ramsey. 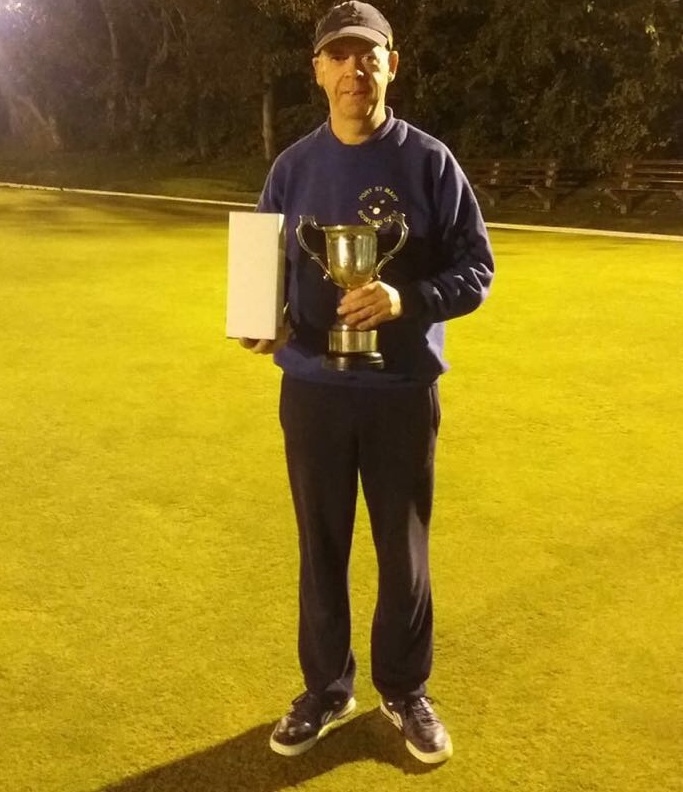 This success will go some way towards making up for the heartbreak Quayle suffered in 2017 when he missed out on the individual merit to Marown’s Colin Kelly, with Quayle having led the merit for the entire season he lost only his second game that season again at South Ramsey, which ultimately cost him the individual merit trophy. Onchan A took on Peel at Onchan Park on Monday evening with only three points separating the teams third spot was still achievable for the visitors. Both teams were missing key players notably Phil Kerruish for Onchan and Dave ‘Barney’ Kelly for Peel. The home side showed their dominance on the night with a 9-1 win with Kevin Quirk and son Matthew both winning 21-8 against David Smith and Peel captain Stevie Kelly respectively. Mark Kelly and Rob Monk both won 21-10 with Jordan Cain recording a good 21-13 win over Tommy McMeiken. Adrian Skinner was pushed hard by Tom Kelly with Skinner winning 21-18. Saving the whitewash for Peel was Gary Smith who beat Edward Carlyle 21-20. Marown A took on Douglas A at Crosby with the Villa men rather disappointingly only managing to field seven players. Marown recorded a 9-1 win with Colin Kelly beating Shaun Seal 21-4. Despite the result the Douglas men scored well in four of their losses with Gary Conwell losing 17-21 to Neil Withers, Keith Rise reached 18 against Peter Kelly, Ian Moore lost out 19-21 to Gary Weightman who stepped in from the C team to record a fine win, whilst Jimmy Sansom fell at the final hurdle losing 20-21 to Phil Kelly. It was also good to see John Gelling make his first league appearance for over two months winning 21-14 against Mervin Sayle. Visiting captain Andy Kennish recorded the win for Douglas with a 21-15 victory over Paul Kelly. Champions South Ramsey recorded their 21st win of the 22 game season with a 8-2 home win over Castletown A. Missing for the home team were John Kennish and Peter Collister which gave the northerners the opportunity to give some experience to two of their up and coming players. 15 year old Austin Hart lost 6-21 to Jeff Kinley, whilst 10 year old Ryan Hargraves playing in the same team as his Dad and making his first appearance in the top flight lost 7-21 to Castletown captain Ian Watson. Hitting back for South Ramsey were David Bradford with a 21-9 win over David Quayle, captain Glynn Hargraves beat Peter Oates 21-10. Stefan Kelly recorded a 21-3 win over Clifford Clague. Dave ‘Dido’ Kelly beat Jordan Drewett, whilst Alan Moore recovered from a poor start to beat Juan Kermode 21-19 and Chas Grills just got over the line 21-20 against Dean Kinley. North Ramsey A travelled back north on a high despite giving a game away thanks to a 2-8 away win against Port Erin A recording only their second away win of the season. John Cannan and Tony Smart both won their games 21-20 against Christopher Dent and David Cain respectively. Marown B also finished their season positively with a 3-7 away win against bottom of the table Douglas B. The Crosby outfit will be looking to push on next season and improve on this year’s finish. South Ramsey B travelled to Port St Mary A safe in the knowledge that their top flight status was secure coming away with a 3-7 loss. Winning for the visitors were James Teare to single figures over Thomas Keggen, Steven Waters won a close game 21-18 against Steve Franks and Tony Dugdale won 21-12 against Dan McCabe. For the home team Wayne Roberts, Paul Skelly and Rob Cooil all came in with 21-7 wins over Sid Bolton, Steve Moore and Martin Caley respectively, with captain Trevor Quayle winning comfortably 21-10, whilst Steve Hall won 21-18 against George Brew. On Wednesday evening Port St Mary A hosted North Ramsey A in a rearranged game, with the home team winning 6-4. North Ramsey will have been pleased with their weeks work away from home with wins from John Cannan, Geoff Porter, Ray Skelly and Steve Parker. For the home team captain Trevor Quayle had a comfortable 21-8 win which was enough to seal the individual merit. Also winning were Dan McCabe, Steve Hall and Wayne Roberts with the southerners taking the aggregate winning by 13 chalks on the night.